Hurricane Irma exploded across the Florida Keys. Many residents evacuated, only to return to devastation. Mobile homes are piled high on sides of U.S. Highway 1; useless refrigerators and household appliances are heaped up across the street. Damaged boats floating adrift must be hauled out of waterways. Florida Keys residents are Americans though. They are rebuilding. Bob Leone of Port St. Lucie, Florida is a part of the reconstruction process. He feeds the U.S. military which is in the Keys helping families make their homes habitable again. Each day Bob appears for duty at 4AM to oversee the logistics of feeding 500 military personnel in Key West at the Trumbo Naval Station. Currently, the National Guard and U.S. Armyhave set up a base camp there. 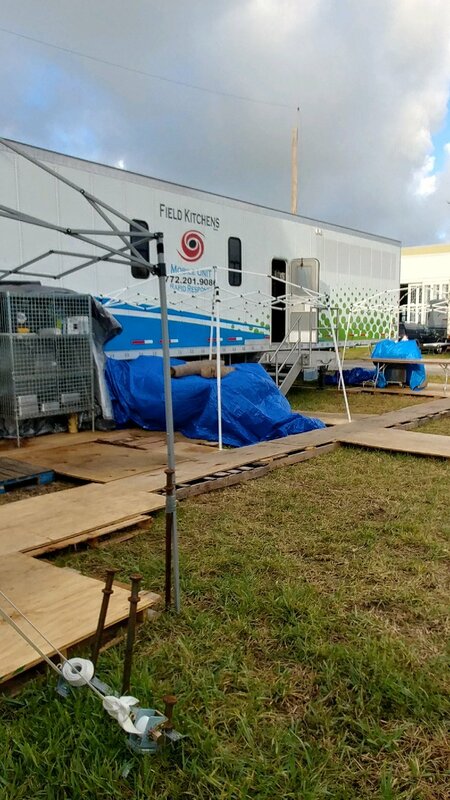 The camp runs strictly off of generators. In all, Bob Leone expects to be 30 days in Key West. The feeding service team is 17 strong, with 11 to 12 staff working every day to put together breakfast, a boxed lunch to go, and an evening supper. 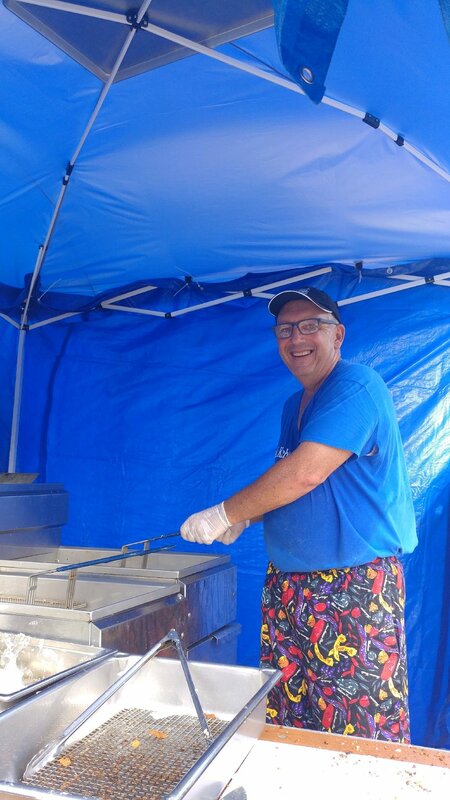 Before coming to Key West, Bob Leone and crew were stationed in Miami, at Miami Dade Community College, North, preparing 1000 to 2500 meals daily for FPL line workers who had come from all over the country to power Florida back up. After 10 days in Miami, the call came in for the Antonini team to move to Key West. Leone operates his team’s work out of two tractor-trailers. The first is a 55 foot unit built especially for first-responder meal provision, complete with convection ovens, preparation tables, an ice machine and coffee maker. It too operates on a generator. From arrival to being fully operational is only two hours. The second tractor-trailer is filled with equipment. It must be unloaded, pressure washed, and bleached, and will serve as the sub truck where boxed lunches are prepared. Sleep is precious. During the first few days at a site, Leone and crew only have about four hours each night, between 11PM and 3AM to close their eyes. Afterward, the time increases to six hours of rest. “It’s brutal,” Leone adds. Meals aren’t tv dinners and a box of cornflakes for breakfast. Leone serves hardy quality food. Breakfasts are two or three types of eggs, hash, sausage and gravy, cereals, fresh fruit, bacon and sausage. Evening suppers back at camp may be stuffed pork chops or Salisbury steak with potatoes, vegetables, salad and dessert with a daily changing menu. Bob Leone’s daughter, Angela Leone Buzan, flew in from her home in San Diego, California to participate as well. This season she arrived just prior to Irma and was ready for immediate deployment. Angela took charge of the sub lunch truck, overseeing its operation for three weeks. Bob Leone states, “Serving with my daughter for three weeks has been the best part of this work.” Angela is 28, a professional Pilates instructor, she owns her own studio. Bob Leone began working hurricanes and snow storms as a first-responder with John Antonini in 2005 when Hurricane Katrina hit. Their reputation is well known with FPL and the military as providers of quality delicious food and with the ability to feed thousands in days. Leone prepares for this work. Each week he and Antonini inspect their tractor-trailer unit in storage, firing it up and making sure that all aspects of it are in working order. Previously, Antonini was a caterer and Leone a chef. Together the two friends have made a tremendous difference in the aftermath of storms. Leone states that he enjoys the appreciation of the folks he feeds. You normally can find Bob Leone at Acquisition Experts in Stuart where he is a professional business broker, helping people buy and sell businesses, or at the Saturday night service of Morningside Church in Port St. Lucie. He and his team have abruptly given up their time and lifestyle to help feed others. He is indeed a Hometown Hero.